A baked egg dish made with chorizo sausage, grape tomatoes, and fresh spinach. Pre-heat the oven to 375 degrees F. Remove casings from chorizo and slice into 1/4-inch rounds. Cut the rounds in half. In a medium bowl, whisk together the eggs and cream. Season the eggs with salt and pepper, add 1/2 cup shredded cheese, and whisk or stir to combine. In a large ovenproof skillet heat the oil over medium-high heat. Add the chorizo and onions and cook until the onions are soft and translucent. Add the spinach to the skillet and cook until the spinach has wilted, stirring occasionally. Add the tomatoes to the skillet and cook for 1 to 2 minutes. Add the eggs to the skillet and stir to combine. Sprinkle top with remaining 1/2 cup shredded cheese. Cook for 2 minutes and then transfer pan to the oven. Bake for 20 minutes or until the eggs have set. 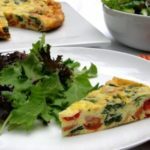 Cool in the pan for 10 minutes then transfer frittata to a serving platter. Slice and enjoy. Leftovers can be refrigerated and served cold or re-heated.